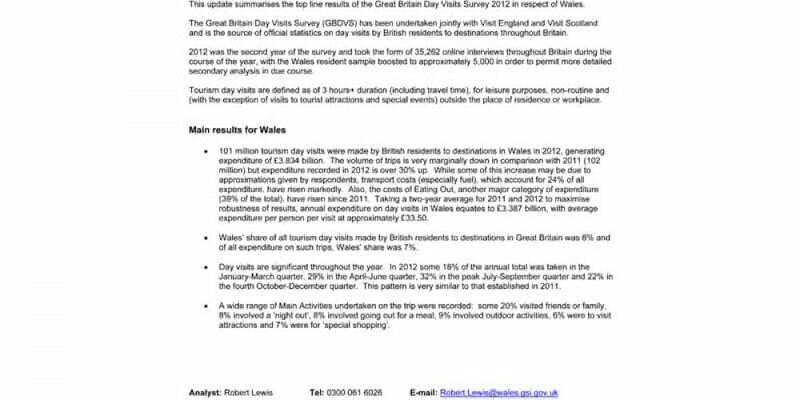 This update summarises the top line results of the Great Britain Day Visits Survey 2012 in respect of Wales. 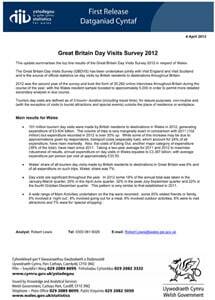 The Great Britain Day Visits Survey (GBDVS) has been undertaken jointly with Visit England and Visit Scotland and is the source of official statistics on day visits by British residents to destinations throughout Britain. 2012 was the second year of the survey and took the form of 35,262 online interviews throughout Britain during the course of the year, with the Wales resident sample boosted to approximately 5,000 in order to permit more detailed secondary analysis in due course.